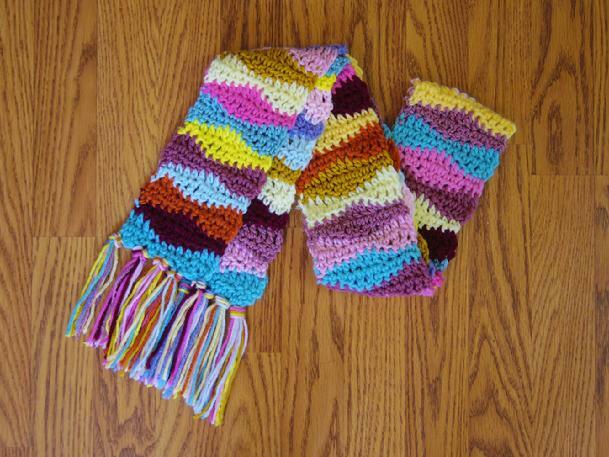 Modified from The Crochet Handbook and Stitch Guide pattern "Interlocking colors"
Scarf is about 80 to 84 rows long. PATTERN: Change yarn every 2 rows. Row 1 (1st time only): 1 sc in 2nd ch from hook, 1 sc into each of next 3 chs, 1 dc into each of next 4 chs, 1 sc into each of next 4 chs (end of row), turn. Row 1 (all other times): Ch 1, 1 sc into each of next 4 dc, 1 dc into each of next 4 sc, then 1 sc into each of next 4 dc, (working last sc into 3rd of 3-ch at end of row), turn. Row 2: Ch 1, 1 sc into each of next 4 sc, 1 dc into each of next 4 dc, then 1 sc into each of next 4 sc (end of row), turn. Row 3: Ch 3 (counts as 1 dc), skip first sc, 1 dc into each of next 3 sc, 1 sc into each of next 4 dc, 1 dc into each of next 4 sc (end of row), turn. Row 4: Ch 3, skip first st, 1 dc into each of next 3 dc, 1 sc into each of next 4 sc, 1 dc into each of next 4 dc (end of row), turn. Change color and repeat Set 1, Set 2, Set 1, until desired length.